There are now just two weeks left until our epic conquest of Snowdon, Cadair Idris and Pen y Fan (eek! ), which probably explains my choice of destination on Saturday. Thus far our team training walks have all been in relatively cool, and often very damp, conditions meaning that my hot weather conditioning probably isn't what it should be. Therefore a six or seven mile trudge through the sand dunes at Kenfig NNR under clear skies and a blazing sun sounded like just the ticket, plus I'd get to squeeze in some decent birding as well. Compared to my last visit a couple of weeks ago there were far fewer birds present on the walk down to the lake, although I did manage to find the majority of expected spring migrants. 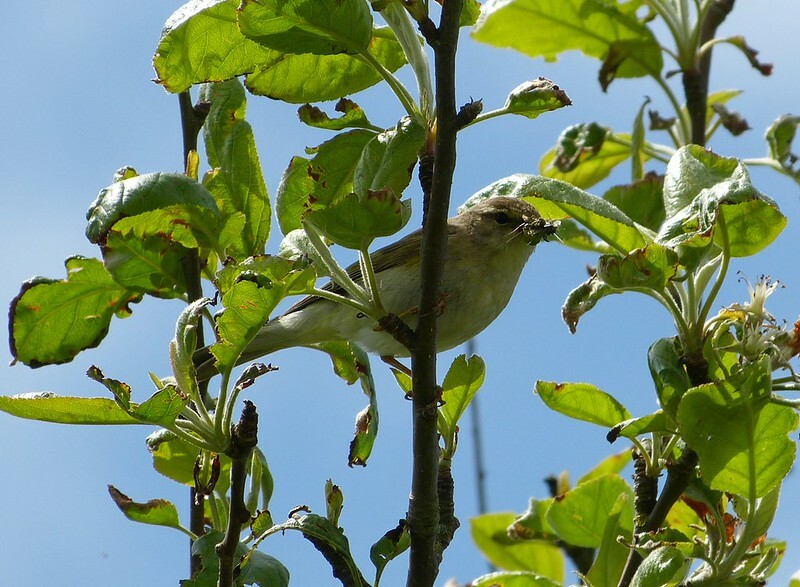 A singing male Whitethroat, Chiffchaff, calling Swifts and Swallows plus several Willow Warblers were all showing pretty well, especially the latter which included the individual above replete with an insect stuffed beak. What was new however were the fifty or so Starlings noisily feeding in the bordering fields. The majority looked to be from this years breeding season and they seemed intent on telling everyone within ear shot just how happy they were to be on the wing. 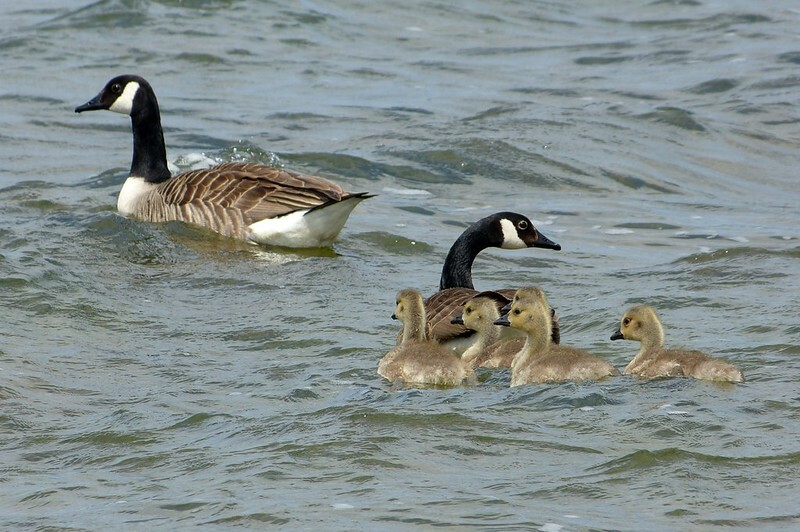 Slightly less vocal were a flock of thirty Canada Geese including this pair with five goslings. Everybody say awwwwww. 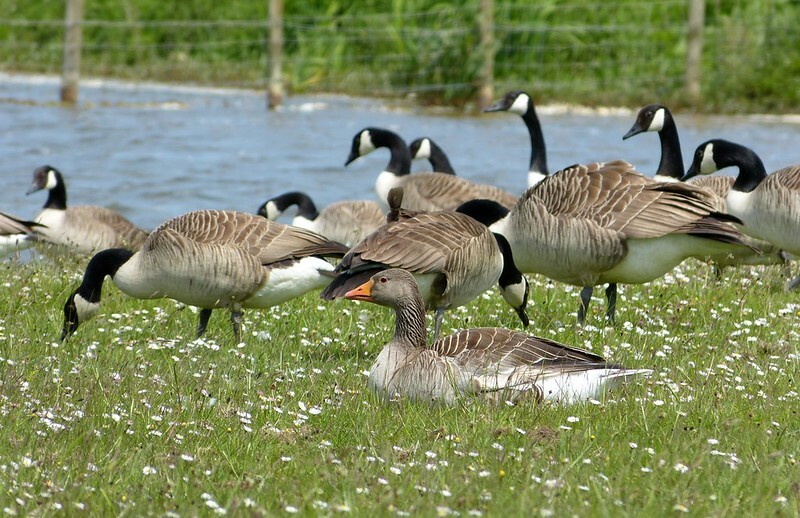 The single Greylag Goose is also still present and doesn't seem to have shaken the notion that it too is a Canadian..
At the north hide I could hear at least two Reed Warblers singing and enjoyed watching a Sedge Warbler hopping through the reeds at close quarters. Again numbers seemed lower here than earlier in the season but that may have been due to fewer singing or the thicker vegetation simply obscuring them from view. For the first time this year there were also several species of Damselfly on the wing though sadly my identification skills aren't quite up to telling you exactly which ones. 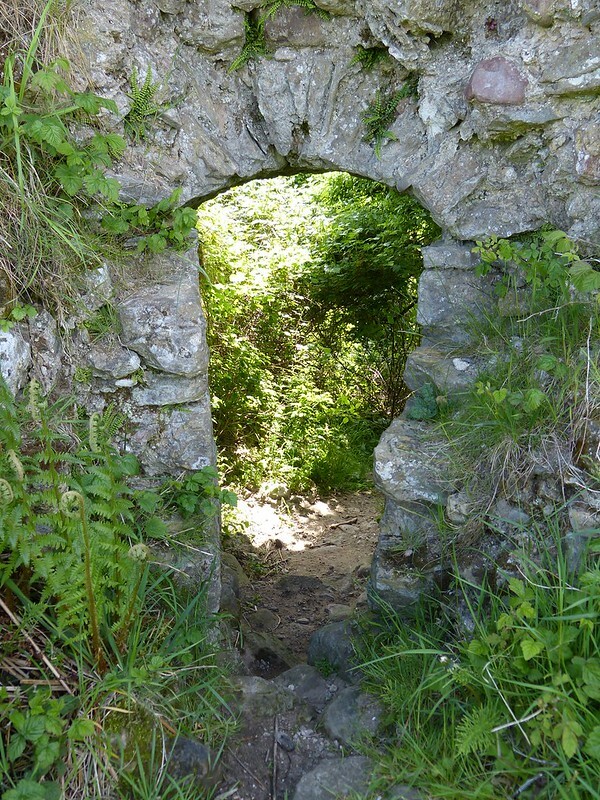 My next target was the ruins of twelfth century Kenfig Castle which I last visited two years ago. Finding it is not an easy task and my route through the dunes doubled back on itself more than once as I was forced to skirt small copses of trees and standing water. Eventually the half buried remains hove into view and I set about exploring what turned out to be a far more extensive complex than I'd previously realised. Much of that is likely down to the Bracken and Brambles having not yet engulfed large areas which allowed me to access the surprisingly well preserved inner structure. There I found tantalising glimpses of what the castle used to look like including a large window and arched ceiling. 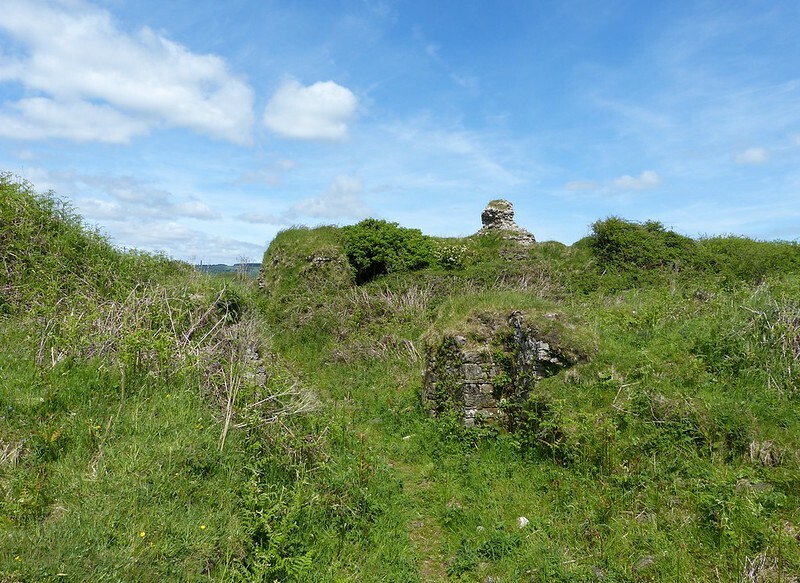 Those of you in the UK may have seen Kenfig castle featured on the last series of Time Team which revealed the settlement that used to surround these fortifications as well as the hard life of its inhabitants. Occupied by the English they were almost continually under attack from the Welsh with the castle being sacked on at least six occasions in 1167, 1183, 1232, 1242 and between 1294 and 1295. It is perhaps ironic then that it was the dunes themselves which finally forced the invaders out as sand slowly engulfed both the village and castle. How I'd love for it all to be cleared away so that we could see what lies beneath. From ancient history I returned to the present day as my route followed the river Kenfig towards its terminus with the coast. Along the way there was plenty of opportunity to observe yet more Willow Warblers as well as a pair of Jays and a Grey Heron fishing in a neighbouring farm pond. 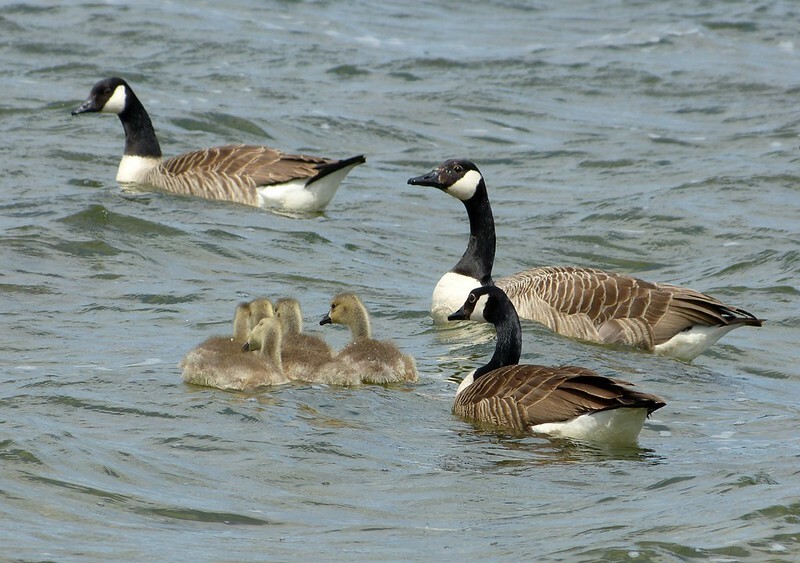 Keeping it company were another four Canada Geese with a healthy brood of twelve goslings. 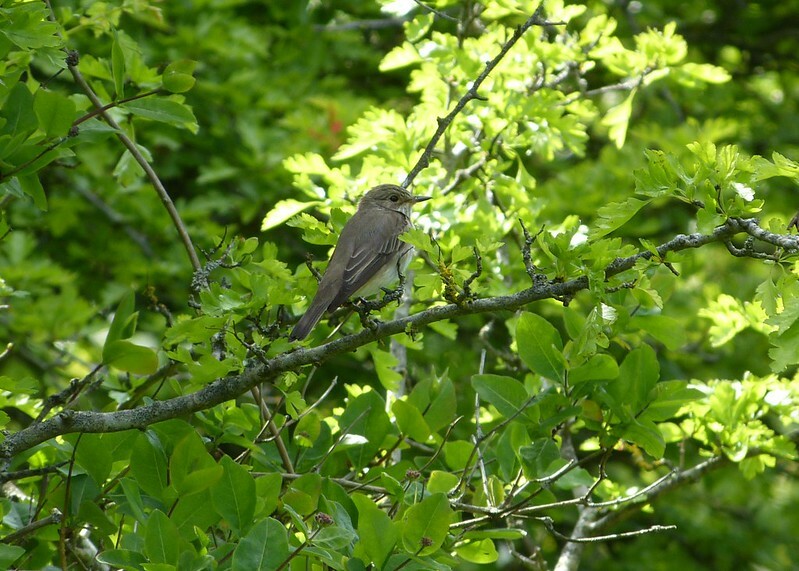 The real treat of the day though belongs to two Spotted Flycatchers which I found flitting along the path ahead of me. Notoriously skittish one landed at not too great a distance for me to complete my "slightly too small spring migrant in a tree" collection. Very nice. Down at the salt-marsh a trio of Grey Herons were flying overhead with a male Reed Bunting about the only other bird visible. Singing Reed Warblers and Sedge Warblers were evident however plus at least one Cetti's Warbler. It was to the ground I should have really been looking though as I came within a couple of millimetres of squashing a large Grass Snake with my size tens. I only just caught sight of it from the corner of my eye before it was off like a shot into cover. Those things can really shift when they want to! By now I was considerably more singed than a few hours earlier so it seemed like an ideal time to head back inland before the landscape of endless sand dunes drove me completely mad. On the way a single Lapwing was calling noisily and there seemed to have been a decent emergence of what I think were Small Blues. They were way too mobile to photograph but reminded me that I'd caught a Small Heath on camera earlier in the day. 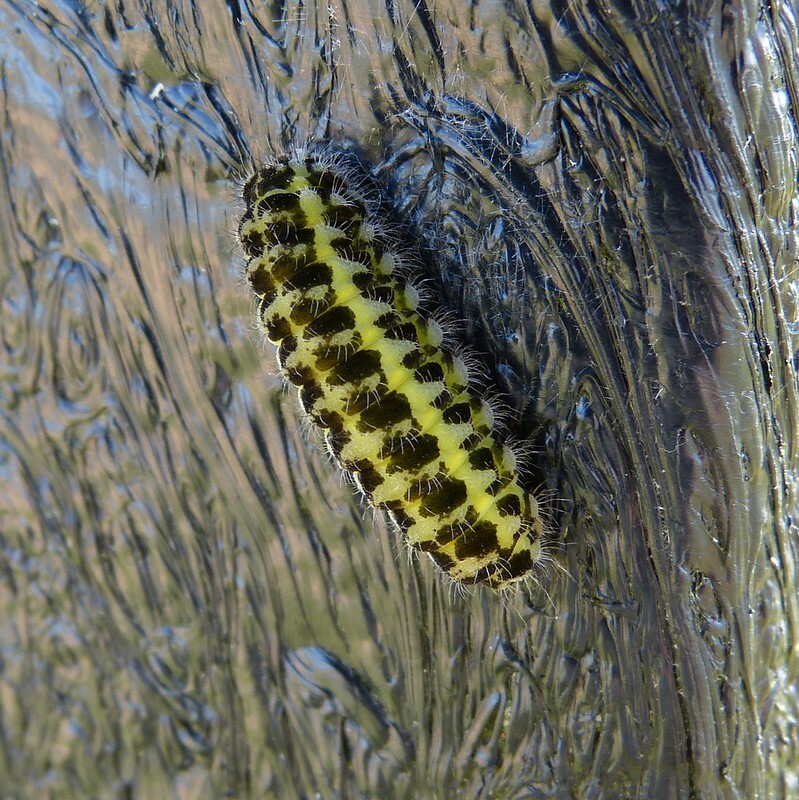 A pause for breath delivered a colourful Burnet moth caterpillar on the very post against which I was resting. When I finally got back to the car I wasn't as dead as expected which bodes well for our three peaks challenge. If the heat is at a similar level however I may need to make like a Camel as I only had just enough water to keep me going. That's all I need; more weight to carry! thanks for posting the highlights of your hike....(we get to see them without doing any of the work!). Wonderful birds and everything looks very green and lovely in spite of the heat. 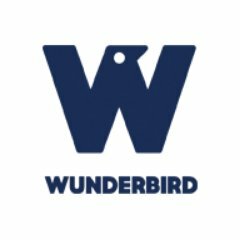 A great series - beautiful birds and the castle looks fascinating. A(nother) lovely post, Adam. Great to see the castle masonry, too. 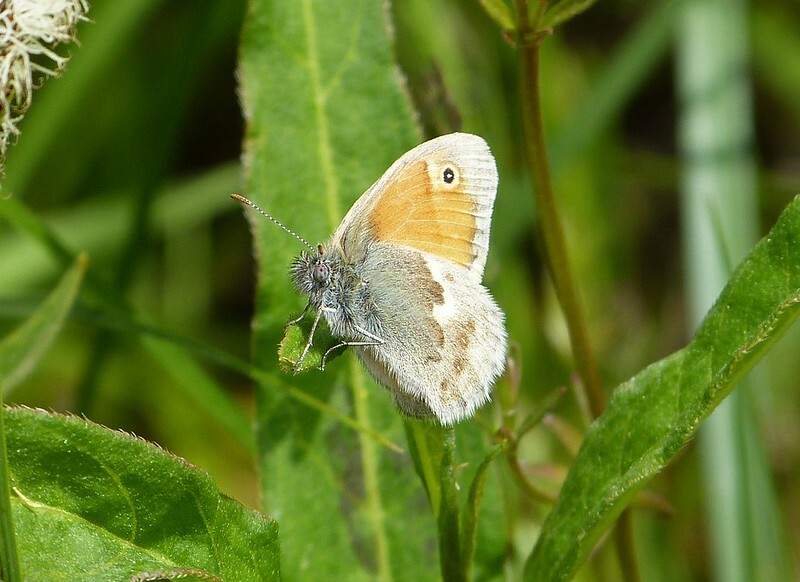 We have yet to see a Small Heath, though butterflies are becoming more frequent ... along with Dragonflies. Great set of shots Adam. Good luck with the three peak challenge. I get worn out going up stairs. Good Luck Adam.... follow everyone else you cant go wrong. Love the Spot fly in this post. A brilliantly captured walk. Best of luck for "the big one".